Statoil is headquartered in Stavanger, Oil Capital of Norway. Flickr/Bruce Tuten. Some rights reserved.Last week marked the launch of a book that has been a long time in the making in Norway. With the title “The Bridge to the Future” (Broen til framtiden), it brings together representatives of an unprecedented movement - built through many years of patient collaboration between environmental organisations, trade unions and forces within the state church - for 100,000 climate jobs. These green jobs are seen as bridges; between the immediate needs we have for secure, decent work and the needs of all life on the planet to avert climate catastrophe; and, crucially, between Norway’s oil addiction and a sustainable future. The book is therefore not an end goal or a history of past events. It’s another step along a long road towards a common goal: a just transition to a sustainable society. Nonetheless, this transformation is grounded in the best of Norway’s past - workers’ organisation at the grass roots, workers’ rights, active social movement participation in shaping politics, and a strong state role in guaranteeing welfare. The alliance and the new book together make a clear demand: we cannot wait for the market or individual lifestyle changes to pull us away from the edge of the cliff; we must mobilise for a sustainable society together. And it needs to happen now. Opened by the leader of Norway’s largest trade union and the president of the Electrician and IT Workers’ Union, the book itself reflects the different facets of this unprecedented collective challenge. Firstly, new alliances are required to bring about historic social change. “There are no jobs on a dead planet” is the main message in a contribution written by the general secretary of the International Trade Union Confederation (ITUC), Sharan Burrow. Business-as-usual is simply impossible - not just to keep to a fair ‘carbon budget’, but for several other reasons too. As Helge Ryggvik, one of the country’s leading historians of the petroleum age, explains, the industry has increasingly negative effects on the rest of Norwegian society. Calls to organise across traditional divisions are across all sectors. Not only in the unions, but also from a bishop in the state church, and the leader of Friends of the Earth Youth Norway, who insist that climate justice must be realised in our time. Secondly, these alliances are crucial in concrete examples of resistance to the suffocating dominance of Norway’s oil and gas industry. Resistance can take many forms; from the role of law in legal challenges to further oil exploration in the Arctic and in guaranteeing rights through a just transition, to the recent student campaigns for divestment from fossil industries. These have also raised debates in Norway about the role of universities and research and its relation to global warming and the carbon budget. Together, the campaign and the new book shine a light on the overwhelming influence of oil and gas in Norwegian academia and cultural life, and mark an important step in challenging these practices at their very source of financial gain. Thirdly, the campaign is not about opposition for opposition’s sake: we will win not just through saying no to oil and gas, but by promoting an alternative - particularly through new green jobs across the country. Building on expertise and organisation already found in the Norwegian workforce, including many of those currently working directly or indirectly in oil and gas, existing rights and welfare can be protected and maintained through new jobs in everything from farming and fisheries to transport and renewables. In the new book, representatives of workers profile some exciting developments in these industries. This is where the unions are central: their strong standing in Norwegian society means it’s possible to organise broadly across all sectors to build a working economy that doesn’t cost the earth. Fourthly, this vision demands political management; a just transition cannot be left to the whims of the market. Bert Schouwenberg of the GMB makes this point persuasively in the book through the example of the unjust transition in British coal. Furthermore, this transition must be democratic, not least involving workers currently engaged in the petroleum complex. Our alliance, “Bridge to the future” is young and growing, but has already made major strides: two huge conferences in Oslo, gathering trade union activists, environmentalists, church members, researchers, and others to discuss a just transition; and collecting 10,000 signatures calling for a halt in oil extraction and 100,000 climate jobs. Two weeks ago, just before the launch of the book, leaders from the church, environmental NGOs and the top labour unions spent a day together on a boat sailing to a political meeting in Norway, discussing possible routes to a just and sustainable future and making strong demands to the government in the run-up to Paris. The transition has started. But more will be needed to wean Norway off its oil addiction and replace it with renewable energy, transport and other green jobs. And yet there is hope in the remnants of the petroleum sector: there is no better example of creating new industries than the building of the Norwegian petroleum sector from scratch 40 years ago, steered democratically by the state to ensure that the new-found wealth would benefit the whole country and support the welfare state. 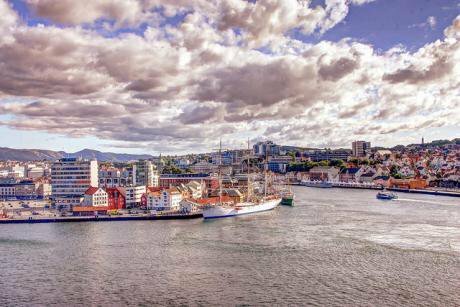 Norway has retained its social democratic traditions and largely avoided the ‘resource curse,’ including putting aside a significant proportion of its oil wealth for future generations in the country’s sovereign wealth fund. If it takes 40 years to build a world-leading petroleum sector, just imagine what we could build with 40 years of building renewable, fair and clean industries. Under the threat of climate change, and with unstable prices of fossil fuels and other dirty industries, the time to build a bridge to the future is now. The book is currently available in Norwegian only, but more information about the initiative and campaign can be found here.